Once again, YMCA d’Haiti reunites the leaders of the communities around peace. They attend the ceremony of the presentation of the 8th Peace Medal of the YMCA of Haiti on January 20th, 2018. This year the medal was awarded to Eng. Alain Jean-Pierre. It is the first time that a sport activist received the prestigious distinction from the YMCA d’Haiti. Engineer by profession, M. Jean Pierre is best known for his sport activities where he is also a trainer who transmits healthy values to the youth. In his speech, he emphasized that he is a man of action who’s only satisfied if what he transmits is being applied by the youth. 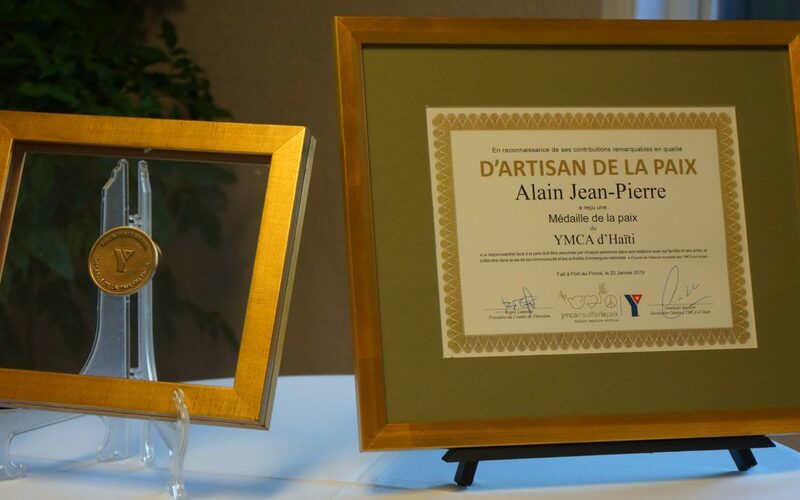 M. Jean Pierre was rightly honored for his efforts, courage and charity as the 8th Peace Medalist of the YMCA d’Haiti. The YMCA d’Haiti is proud to show the way with the former Medalists as role models for the youth. It is important that they participate every year in an event where they could exchange with these figures of our society while they search for their future.